After a great response to this pizza from those that attended the Maximized Living recipe night at West Cobb Chiropractic I decided to post it for all to enjoy! Thanks to Dr. Melissa Sell for discovering this gem. 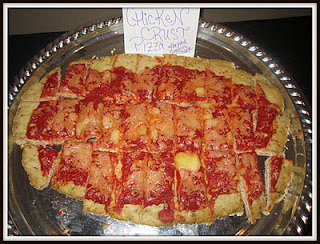 And yes, you are reading the title right, this is a pizza with a crust make out of cooked chicken. You will NOT believe how good this is! Try it as soon as possible! Boil chicken thighs for 12-15 minutes or until cooked through. Combine eggs with 4 cloves of garlic and Italian seasoning. When chicken is done, blend it up in food processor or blender (you’ll want to blend them 2 at a time so they shred thoroughly, then put them into a mixing bowl). Add egg mixture to chicken and form it into a dough. This recipe makes 2 pizzas (because 1 is never enough), so grab 2 baking sheets and 2 pieces of parchment paper to line the pans. Separate dough equally and roll out to desired size. Bake for 12-15 minutes in a 425 degree oven. While the crust is baking, melt down the butter in a saucepan and add 2 large cloves of shredded garlic. When crusts are finished, take them out of the oven and let them cool for a few minutes. Divide garlic butter and distribute evenly over the crusts. Now it’s time for toppings! I kept it simple with just pizza sauce and cheese, but you can get as creative as you want. Bake again for 15 minutes or until cheese is melted/toppings are cooked. Throw a few ripe avocados, a bag of frozen strawberries and a bit of stevia in the blender to complete the meal with some strawberry gelato! So there you go! Advanced plan pizza and ice cream!